The Abbey Road high and dry after a record season. 2018 was the busiest season ever for the Abbey Road! 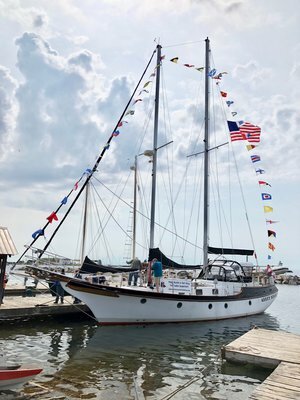 She was out on the water 109 days with 982 guests and sailed 1995 nautical miles on trips from Bayfield to the Apostle Islands, Grand Marais, MN and Isle Royale. 17 days were bareboat charters. Our calendar for 2019 is filling up fast and requests to Sail With Us can be made on our website. Thanks to the generosity of donors and some revenue from the bareboat charters, LSTS did not charge a fee to take area kids sailing on Abbey Road in 2018. We continue to seek Volunteers, Buoyancy Brigade Members, Plank Owners and Corporate Partners to help us expand our programs into the future. We are working to build or purchase a Tall Ship to expand our programs and take more kids sailing on Lake Superior! Our trips are “Un-plugged” experiential learning voyages. Teamwork is required which fosters acceptance of others, cultivates personal responsibility and helps develop leadership skills. Longer trips can be physically and emotionally challenging for some participants (although not dangerous). As controlled risks are overcome by participants they discover hidden strengths, acquire new skills and increase self-confidence. The Abbey Road is an excellent platform for small groups and we will continue sailing her into the foreseeable future. We would like to take more kids sailing on Lake Superior but we are not able to do this with the 52’ Abbey Road alone. Our goal from the start has been to build the Alice Craig, a replica of a US Revenue Cutter that sailed Lake Superior from 1859 to 1887, but it could be several years before we are in a position to lay her keel. However, there is a schooner currently listed for sale on the East Coast that would be a great boat to expand our fleet. The Mystic Whaler is 110’ overall with room for 50 daysail passengers and 30 overnight guests. She is a great platform for onboard education. We are looking to purchase this schooner and bring her to Lake Superior. We would rename her Algonquin, after a vessel that was brought to the lake in 1842. Have a positive impact on tourism. We know that bringing a Tall Ship to Lake Superior will not cure cancer, feed the hungry, or house the homeless, but our hope is that kids who sail with us will be inspired to do great things in the future because they were able to see the world and themselves a little differently from the deck of a schooner. How can you help kids experience great adventures, make amazing discoveries (often about themselves), and become good stewards of Lake Superior? We are seeking "Plank Owners" to help us purchase the Mystic Whaler, recommission her as the Algonquin, bring her to Lake Superior and fund scholarships to take kids sailing. Plank Owners will receive appreciation gifts, invitations to exclusive events, special recognition and sailing opportunities that vary depending on the level of giving. Whether It’s Through Monetary Gifts, In-Kind Donations Or Volunteering, Our Corporate Partners Play A Vital Role In Supporting The Operation And Experiential Education Programs Of Lake Superior Tall Ships. We can Tailor Partnerships To Meet The Goals Of Each Corporate Sponsor While Also Meeting Our Mission. Your Volunteer Contribution Will Make A Difference. Whether You're Able To Help With A Single Event Or You Have The Time To Assist On A Regular Basis, A Rewarding And Invaluable Experience Awaits You. Please contact Gordon Ringberg at sail@lakesuperiortallships.org to learn how your donation, sponsorship or volunteerism will help kids experience great adventures, make amazing discoveries (often about themselves), and become good stewards of Lake Superior.